Both the AAP and ADA recommend the continued use of the dental materials. The AAP article concludes: "On the basis of the proven benefits of resin-based dental materials and the brevity of BPA exposure, we recommend continued use with strict adherence to precautionary application techniques. Use of these materials should be minimized during pregnancy whenever possible. Manufacturers should be required to report complete information on the chemical composition of dental products and encouraged to develop materials with less estrogenic potential. " You can read more about why my family avoids BPA here. New York passed a BPA-free Children's and Babies Act last month. What's going on in your state? Worried about BPA in your baby's teethers? 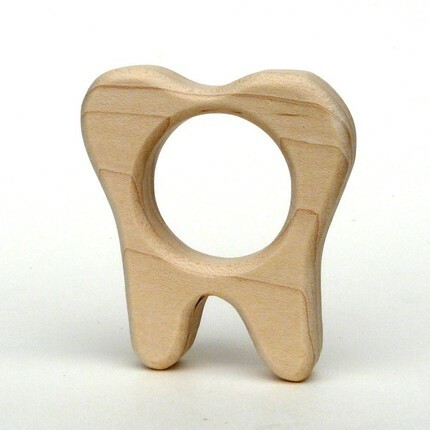 Come back tomorrow for the Little Teething Toy giveaway! Little Sapling Toys is giving away TWO organic wooden teethers to one lucky Nater Tot reader. They're eco-friendly, safe and adorable!